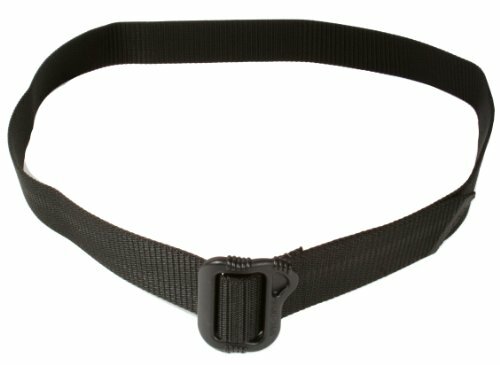 Is A Tactical Belt Different Than A Normal One? Using a high-quality tactical belt is very important if you plan on carrying your pistol around frequently. Unlike regular belts, tactical models are specially designed to withstand the weight of your gun and other accessories you might want to carry around your waist. In the following article, we review 7 of the best tactical belt models of 2019 and reveal their pros and cons. Further, in the article, we explain the main differences between normal and tactical belts, and how to determine which is the right model for you. If you’re looking for a leather belt you can wear every day, but you also want one that will carry your holster, you should check out this model. This belt is made out of high-quality leather right here in the USA. The belt is 1.5” wide and .22 – .23 thick, so it’s very durable. The belt won’t sag or stretch when you use it to carry your handgun. In fact, the belt is strong enough to handle an ammunition pouch or extra magazines without a problem. Good For Everyday Use – This belt looks just like an ordinary plain dress belt, so you can wear it every day without attracting attention. Needs Time To Break In – This is a thick leather belt, so you need to spend some time breaking it in before you can wear it comfortably. 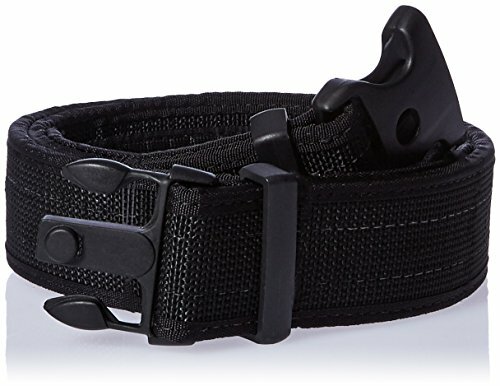 The 5.11 tactical trainer belt is made out of a tightly woven nylon mesh. The belt is durable and comfortable, and you’ll be able to wear it at all times without any problems. The nylon mesh is 1.5” wide, and it’s capable of handling large weights without changing its form. The belt’s buckle is made out of solid stainless steel, and it has a 6000 lb rating. All the stitching is reinforced, so you don’t have to worry about it failing. 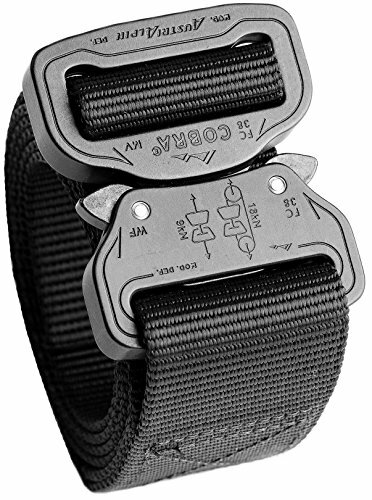 Besides the steel buckle, this belt also uses a Velcro locking system for extra safety. Durable Buckle – The buckle has a 6000 lb rating, so you can use the belt for climbing in an emergency situation. 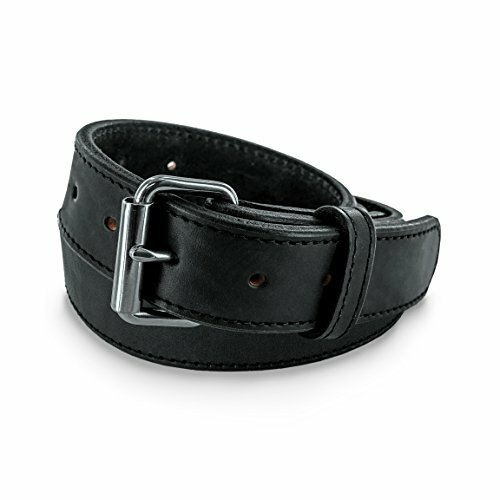 False Size Problems – If you’re buying this belt for an IWB holster, make sure you measure your waist after you strap it in before you place the order. If you’re looking for a strong nylon tactical belt, you should take a closer look at this model. This belt is made out of 100% nylon, and it’s 1 1/2” wide. The tightly woven nylon is very strong and durable, and you can use it for a long time without noticing any changes. The belt comes with an aircraft-grade aluminum alloy buckle. The buckle is very durable, and it’s also comfortable. The belt comes with a lifetime warranty, so you can be sure you’re going to use it for a long time. Has To Be Readjusted – If you wear the belt constantly, you’ll have to readjust it every 4 – 5 days. This tactical belt is 2” wide and has padded edges for extra comfort. The belt is rigid enough to carry your gear, but it’s flexible enough to be comfortable throughout the day. Sizes Seem To Be A Little Large – The belt sizes seem to be a little large, so take that into account when ordering. This premium leather belt looks just like an ordinary model at the first glance, but it’s actually specially designed to carry holsters and flashlights. The belt is made out of a single strip of thick hide leather, so it’s very durable. This model is compatible with all type of holsters, including paddle, loop, snap, or clip models. The differences between this belt and normal models are obvious when you take a closer look. This belt is thicker, so it can carry a lot of weight without deforming or stretching. The thickness also helps to keep the holster in place. 100-Year Warranty – This leather belt comes with a 100-year warranty. This is an obvious sign of the manufacturer’s confidence in this product. Breaks In Over Time – This is a thick leather belt, so you might experience some problems until it breaks in properly. The Spec-Ops Brand tactical belt is made out of high-quality nylon. The nylon has a tight weave, and the webbing is specifically designed to withstand the weight of holsters, extra mags, and anything else you might want to carry around your waist. This belt is very comfortable, and it comes with a micro-adjustable buckle that will provide a perfect fit. This will allow you to make quick changes on the go, so you will never have to feel uncomfortable while wearing your gear. The belt and buckle are not magnetic, so you will be able to go through metal detectors without setting them off. Flip-Tab Buckle Design – The flip-tab buckle design will allow you to make even the smallest adjustments easily on the go. The Elite Survival Systems tactical belt was specially designed to be versatile and have multiple uses. The belt can be used to carry your holster and flashlight, but it can be used with good results in the case of an emergency as well. This nylon belt comes with a 1.75” Mil-Spec webbing that has a 7000 lb rating. The nylon webbing is stiffened to offer more support, and it will carry your gear comfortably. The belt uses a D-ring buckle that’s easy to lock and release, and the buckle itself is rated at 4000 lbs. Comfortable – Even though the nylon webbing is stiffened to offer more support to your gear, the belt is still comfortable to wear. Large Buckle – The buckle is large, and you have to take it off before getting the belt through the belt loops. Are tactical belts really worth it? You probably own several belts already, so why buy a new one? What’s the difference between a tactical belt and a normal one, anyhow? Well, you might be surprised. Unlike regular belts that are specially designed to be comfortable and look good, tactical belts are specially designed to be useful. True, some tactical belt models look really good, but that’s not their main purpose. Their main purpose is to handle the extra weight of your holster, flashlight, and/or other accessories or ammunition you might like to wear around your waist. But wait, what exactly is the difference between the two types of belts? Here’s an explanation. Leather Belts – The main difference between tactical leather belts and normal leather belts is in their thickness. Unlike regular belts, tactical leather belts are thick. A tactical belt might be twice as thick as a regular belt, or even thicker. This will make the leather more durable, so it won’t stretch or rip when you hang your holster or a flashlight onto it. Their buckles are also more durable. Just like regular belts, tactical models also need to be broken into. But unlike regular models, these ones require more effort for this process because they’re thicker. Nylon Belts – You might think that every nylon belt can be used as a tactical belt, but that’s not exactly true. Tactical nylon belts are usually just as wide as regular nylon belts, but they’re more tightly woven. The tight weave offers more strength to the belt, and some models can even resist forces of up to 7000 lbs. 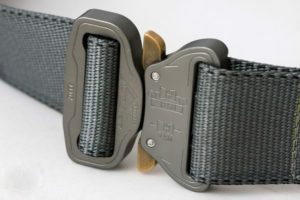 The buckles used by tactical nylon belts are also different than those used by regular belts. These buckles are more durable, and they’re also safer and more secure. As you could see from our short reviews, tactical belts come in different models and at different prices. 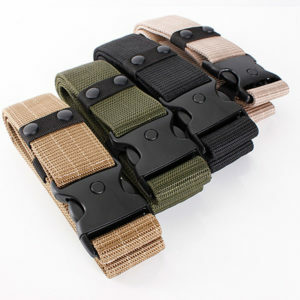 In the following section, we explain how to determine which is the best tactical belt for you. The material used for the belt’s production is very important. Not only will the material influence how the belt looks, but it also influences what you can put it through. Leather – Leather is still used for tactical belt production. But the type of leather used is different than that used for normal belts. Tactical belts are made out of thick leather. Some of them can be .23” thick, so you can be sure they’ll handle everything you wish to carry. 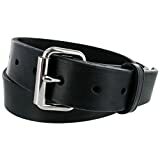 One of the main advantages of using a leather tactical belt is that you can wear it when you’re going to your office job or when you’re picking your kids from school without attracting attention. It’s true that these belts are thicker than dress belts, but they can be a good substitute. One of the disadvantages of using this type of belt is the amount of time you have to spend to break them in. Some people won’t be able to use the belt for several days after receiving it because they won’t be able to close it properly due to the leather’s thickness. Nylon – Many tactical belts manufacturers switched to nylon for their belt models, and that’s understandable. Nylon is very durable, resistant, and it’s cheap. Nylon belts can offer many advantages, and they are usually cheaper than leather models. One of the main advantages of using a nylon tactical belt is its versatility. Some models are very tough, and they will withstand up to 7000 lbs of force. They can be used as an improvised tourniquet, as a climbing tool, or to help you build a shelter in the case of an emergency. One of the downsides of using a nylon belt is that you might not be able to wear it to work, depending on the dress code. They are comfortable enough, but they are not very aesthetically pleasing. A belt has to be comfortable. You’re going to wear it for the most part of the day, so it’s very important to find a comfortable model. Leather belts are usually very comfortable once they’re broken into, and they’ll keep your holster nice and secure. They might slightly inconvenience you when you’re sitting down because of their thickness. Nylon belts are also very comfortable if you find the right size. If you buy a thin belt, it might be uncomfortable because it might push against your belly when you’re sitting down. A tactical belt is only good if it’s secure. Belts come with different types of buckles, and not all of them are very good. If you’re looking for a leather tactical belt, you don’t have to worry about the belt buckle. These belts usually use stainless steel buckles that lock securely in place. Nylon belts, on the other hand, come with different types of buckles, all of them advertised as very good. There are too many types of buckles available on the market to determine exactly which are good and which bad, but here are some general rules they should follow. The buckles have to be easily adjustable. You shouldn’t spend a lot of time adjusting them, and you should be able to do it on the go. Some models come with not one, but two types of locks. They are generally more secure. As you could see from our short reviews, tactical belts come at different prices. Some models are very cheap, while others can be expensive. As a general rule, leather belts are usually more expensive than nylon models, but that’s understandable since the raw material is also more expensive. 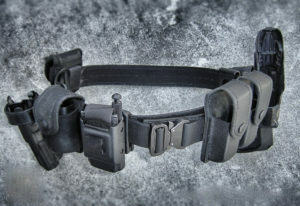 You shouldn’t spend a lot of money on a tactical belt unless you plan to use it frequently, or unless you plan to use it in the case of an emergency, as well. As you could see, there is a difference between how tactical belts and normal models are produced, and how they behave when you’re using them for carrying your pistol. Sure, you could strap the holster to a normal belt, but you might end up ruining the belt and dropping the holster. Tactical belts offer a safe and useful way to carry your pistol, and they will hold the holster in place so you can draw fast. Make sure you measure your waist if you want to find the best tactical belt. They are also designed to be adjustable, so they will fit you just right. Ankle holsters and Glock holsters posts may also help you get the set for your gun, these are well-selected top lists by Shooting & Safety editors.